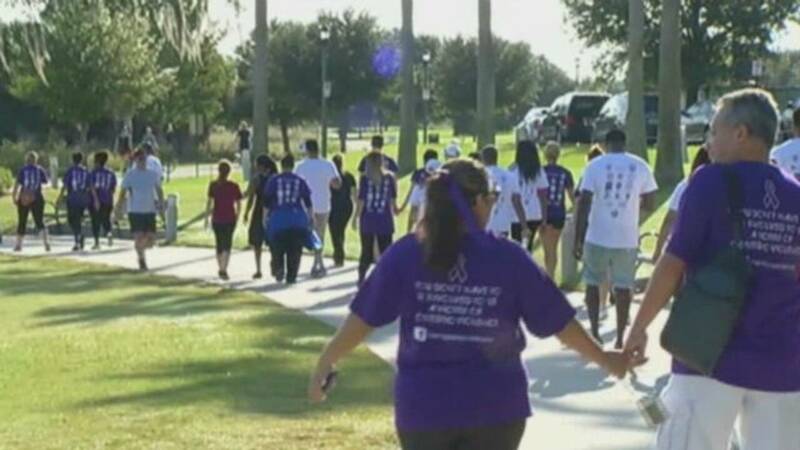 ORLANDO, Fla. - Purple shirts and athletic gear covered Baldwin Park Saturday morning as folks got ready for the annual domestic violence walk. "It's a combination of agencies that all work together to end domestic violence in this community. We do this every year, really to give a voice to all the survivors who don't have a voice," said Carol Wick, CEO of Harbor House. Agencies included the Orlando Police Department, Harbor House of Central Florida and One Hope United. "A lot of people don't realize that it doesn't just affect the victim but the children as well. I think this walk really brings awareness and let's the community know that this is a problem that really needs to be addressed," said Michelle Kearse, case worker for One Hope United. Orlando Police Chief John Mina said while the number of domestic violence and homicide cases dropped over the years, the community still has a long way to go. "We respond to over 3,000 domestic violence calls every year. That's about eight per day. So we take it very seriously. And this is just another effort to raise awareness," Mina said. Wick said the domestic violence walk not only provides resources to agencies, but directly helps domestic violence survivors. "I was able to help a couple of survivors here today who needed services and that's really what this is all about," Wick said. "If you're sitting there thinking, you know, I really need out of this relationship and I don't know what to do, pick up the phone and call us." If you are a victim of domestic violence, call Harbor House at 407-886-2856.